Game set up: Make to two circles with discs 10 to 20 yards in diameter. Place a small goal in the center of each circle. Rules: Outsid the circle players can use their hands or feet to pass the ball. Inside the circles, players CAN only use their feet. Goals score with the head a worth 50 points. Goals can be score from any direction and there is no out of bounds. Separate the player into two equal teams. Variantion: You can add a second ball or you can add a second goal with circle making the player change side of attack. 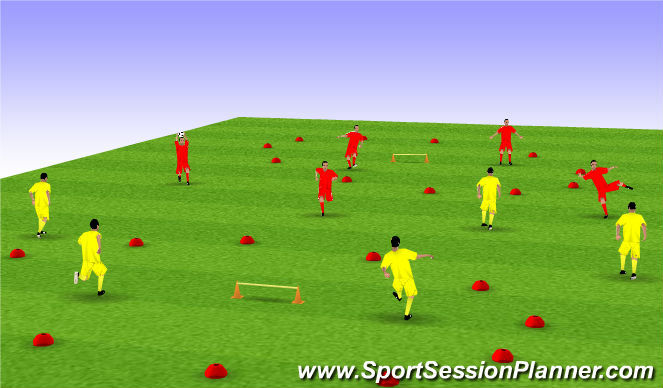 This game emphasizes tactical movements, driblling, communication and startegy of attack and defense and helps with endurance while having fun.